The Week of Prayer began on Friday, with the Pope celebrating Vespers in the Basilica of St Paul Outside the Wall. 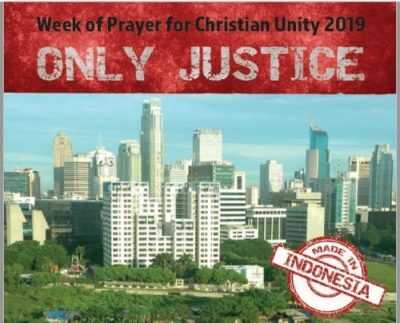 This year’s theme is “Justice, and only justice, you shall pursue”, from Deuteronomy 16:18-20. “This year too we are called to pray, so that all Christians may return to being a single family, according to God’s will ‘so that they may all be one’ (John 17: 21),” Pope Francis said. “Ecumenism is not something optional. The intention is to develop a common and consistent witness that promotes true justice and support for the weakest through responses that are concrete, appropriate and effective”. Ireland’s inaugural service for the Week of Prayer took place last night in the Church of Ireland parish of St John the Baptist in Clontarf. Participants in the service included Church of Ireland Archbishop of Dublin, Michael Jackson; Catholic Auxiliary Bishop of Dublin, Éamon Walsh; and Abba Yohannes Amsalu from the Ethiopian Orthodox Church. The event brought together members of the Salvation Army, Lutheran, Methodist, Church of Ireland, Orthodox and Catholic Church. The keynote address was given by Fr Fachtna McCarthy from St Mary’s parish, Haddington Road. Speaking in advance of the event, Rev Leslie Robinson, parish priest at the hosting parish, St John the Baptist, described “absolutely excellent relations” between the churches in the area. In Clontarf there are three Catholic parishes, a Methodist, Presbyterian and Church of Ireland parish. Rev Robinson said St John the Baptist holds an ecumenical bible study series three to four times a year with one of the local Catholic parishes. “We do a walk between the six churches on Pentecost Sunday and we have a prayer station at each church. We’ve introduced a walk of witness on Good Friday now as well,” she told CatholicIreland.net. In addition, the Church of Ireland parish joins an ecumenical sunrise service on Easter Sunday at the Bull Wall. Clergy from all the churches meet for lunch several times a year. “We just work together and try to provide a united front and provide a Christian witness in a world which is becoming increasingly secular and anti-Church and anti-religion, or anti-formal religion at least. So I think we feel we have a common purpose,” she said. Rev Robinson said on social issues the churches are conscious of the different things that each parish does. “For example, St Gabriel’s [Catholic parish] hosts a soup lunch on Good Friday in aid of Br Kevin and that is hugely supported and our parish would supply a lot of the hardwear from our parish centre. All the parishes support that very well. According to the Church of Ireland minister, the schools are well integrated. “I would attend and robe at the Catholic children’s first Communion and Confirmation services,” she added. Rev Robinson admitted there was “an element of exhaustion” around the Week of Prayer for Christian Unity because it comes so close after Christmas and “because things have moved on so well and we are all working together”. Cherry Poynton, chairperson of the Dublin Council of Churches, agreed that in most areas, people are “keen to work together and to do what we can together” but she admitted there was a problem circulating information on events for the Week of Prayer. Resources for this year’s Week of Prayer for Christian Unity are available online. Some events are posted on social media using the hashtag #wpcu2019.